The Bay Area Basket Makers (BABM) guild was founded in 1984 by Maxine Kirmeyer and Jude’ Silva to support and further interest in basketry as a craft and art form. The guild serves as a source of information and as a means of communication among basketmakers, providing inspiration and friendship. We welcome basketmakers of all levels and expertise, from amateurs to professionals. During the year, we publish 5 issues of our newsletter “Twinings” which is available in paper and by email, as well as on this website. 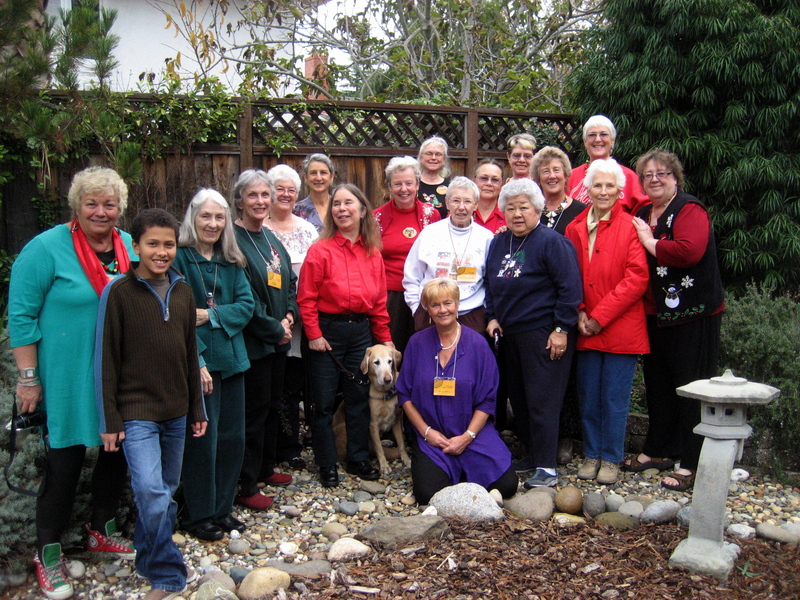 At present, our guild has 78 members–most reside in the greater San Francisco Bay Area but a few live as far away as Colorado, Hawaii, Oregon and Utah. To create their baskets, our members use a wide variety of materials, from the traditional reed, splint, pine needles, plants, kelp, paper, and gourds to more exotics like hog gut, fish skin and fish bones, horsehair, fleece, wire and wire mesh, to reusable finds of plastic bags and yarns – employed in techniques of coiling, plaiting, twining, knotting, looping, felting, randing, and more. Our youngest member is 15-year old Gregory Thomas, already an accomplished basketmaker in his own right. Our most senior member, Florence Powers, is ninety+ and steadily takes home blue, red, and white ribbons from county fairs for her pine needle baskets. I found your website by pure luck and I am glad I did. A friend of mine gave me an old demijohn that his mother used to store vinegar in and probably stored wine in it before that. The bottle itself is in good condition. But the cane basket cover is coming apart. My question is this. Do you know of anyone that can restore or re-do the cane basket cover. I make wine at home and would like to re-use the demijohn to store wine or maybe even store home made vinegar in once again. I live in San Francisco, so if there is someone out there that’s willing to take this on I would greatly appreciate it. thank you for visiting our website. The Caning Shop – http://www.caning.com – in Berkeley might be able to help you with restoring the basket cover of your demijohn. As you may have seen from the Gallery section of our website, we do mainly sculptural pieces, using basketry techniques. I have wanted to learn basketweaving for a very long time, since I studied anthropology in college. I am 30 years old. I live in fremont, and just learned about bay area basketweavers. Please, how can I learn and join you? I want to make baskets from grasses, and pine needles, especially, because I love them. I have a collection of 7 artisan baskets that inspire me, from all over the world. I am inspired by native American basketweaving also. I’m sorry to have discovered that I missed a class through college of marin on sept. 17 and 18 in pt. Reyes. That would have been great. Looking forward to hearing from you. Just stopped in to the show in Gualala! Love when you come all the way up the coast so that we can see what wonders you have been creating. Great double show with David Wayne Floyd, amazing artist. I did an Assemblage workshop with Barbara Fast and had so much fun. Hope you get in touch Loraine and check out Wesharetheheart.com a project created by one of our artists Jane Head that I am also involved with making small hearts and seeing how far they travel in the world. We made 100 ceramic pillow hearts with notes of encouragement to Standing Rock during December. My email is below. Happy to see all the beautiful works. I just subscribed, have made coil baskets in the past out of various materials, but I am also a botanist serving on the Friends of the CSU Chico Herbarium. We host workshops to help support the herbarium, and would love to entice a basket-making instructor to Chico this fall or winter to teach a workshop. Please contact Adrienne if interested! I am attempting to weave authentic replicas of ancient Egyptian royal crowns: the red crown (deshret), white crown (hedjet), double crown (pshent), blue crown (khepresh), and Nefertiti crown. Yes, weave: the crowns were woven like baskets from plant fiber. Re-creating the crowns would be a major achievement in basket making. That’s because no crown has been found. They must be reverse-engineered using clues provided by ancient painted and sculpted depictions. It’s a challenging puzzle. I’ve made progress and had some epiphanies, but the technical problems are daunting. I’m in over my head. The crowns need more basket-making minds thinking about them. If BABM members might be interested in the crowns, let me know. Maybe I could make a presentation to introduce members to the crowns.